We have a wide selection of safes of many sizes and types to choose from in our southside Indianapolis showroom, and we stock AMSEC safes in both our Indianapolis and Fishers locations. 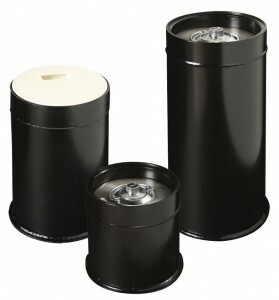 We also offer free UPS shipping on AMSEC Floor Safes. We offer safe opening, repair, and combination change services for safes of all types, and we have a GSA certified safe technician on duty. To learn more, call us today at 317-783-3861 or email us. We've been selling AMSEC Star in the floor safes for decades, in fact these were the safes that Bob started selling when he first began offering in the floor safes. Made in the USA, they are secure, extremely durable, and have been used in thousands of businesses and homes across America. We are proud to continue to offer them. Designed to be buried in a concrete floor, these safes feature a UL listed lock with a removable dial that you can take with you, a drive/drill resistant spindle, and hardplate in the removable door. You can even hide the cover using carpet or tile. They are a wonderful choice for those that are building a new home: simply pour the concrete around the safe body when you pour the foundation. There are three sizes to choose from. Drive/drill resistant spindle preventing damage from burglary attack and additional protection from hold-up. Door, 7-1/4″ diameter clear opening, is 1-3/4″ solid steel. Available with dual key inner compartment. Manager holds one key, the armored car driver, or employee holds the second. Contact us for pricing and availability. Slotted outer door available for additional charge. FREE NATIONWIDE SHIPPING via UPS FOR ONLINE ORDERS, just click the green "Order Online" button below! Inside dimensions 8 1/4" DIA X 5-3/4"
Outside dimensions 8 1/4" DIA X 9"
Inside dimensions 8 1/4" DIA X 10"
Outside dimensions 8 1/4" DIA X 13-1/2"
Inside dimensions 8 1/4" DIA X 16"
Outside dimensions 8 1/4" DIA X 19"